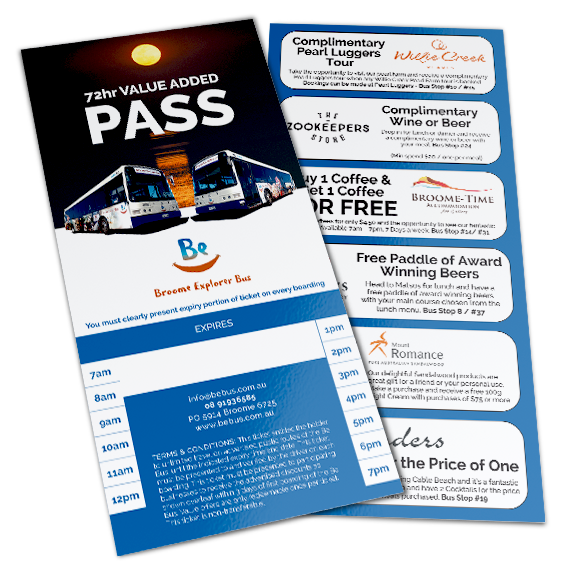 The 24 hour Value Added Pass allows for unlimited travel on the routes of the Broome Explorer Bus. It also provides a range of exclusive offers to allow you to make the most of your time in Broome. 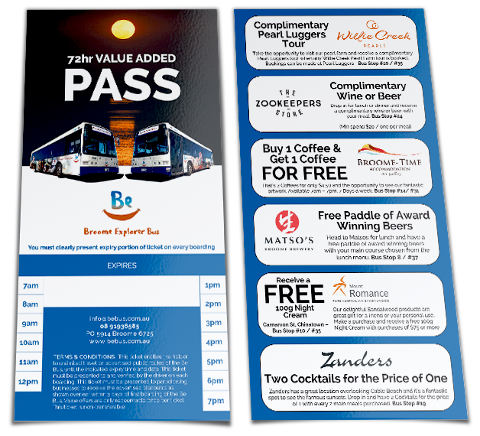 The value added offers include some great dining offers at Matso's Brewery, Zanders at Cable Beach and the ZooKeepers Store, the opportunity to visit an art gallery at BroomeTime Accommodation and to purchase some of the fantastic Sandalwood Products from Mount Romance. If that is not enough then book a trip to Willie Creek on our website and receive a complimentary entry into Pearl Luggers, one of the highlights of your trip to Broome. On the Broome Explorer Bus children under 16 travel for free with an accompanying adult so the pass really is great value. We encourage you to jump off at a range of stops which will be announced on our commentary system and to explore Broome as much as your time allows.